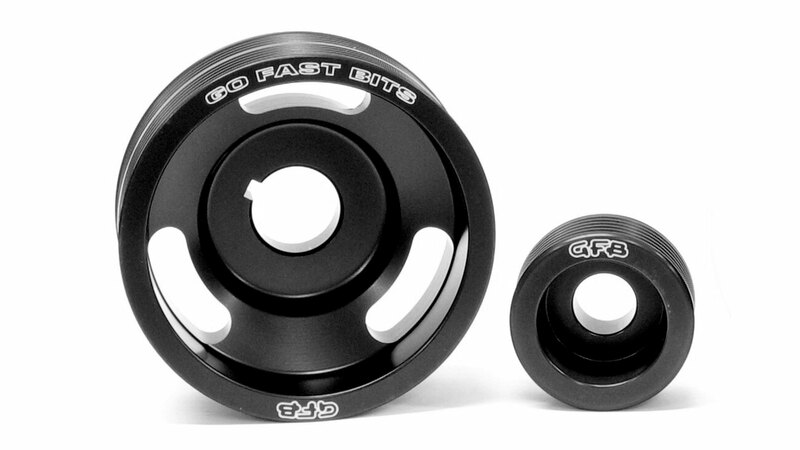 GFB’s Lightweight Pulley Kits offer sharper throttle response and faster acceleration by significantly reducing the rotating mass at the engine. 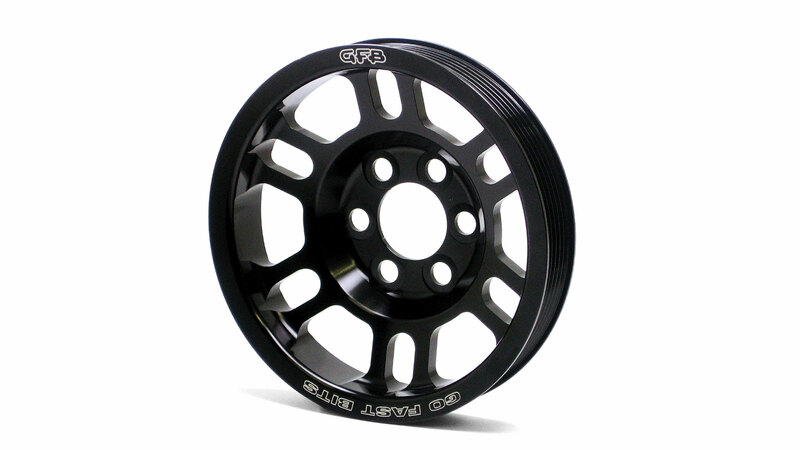 Made from a single billet of 6061-T6 aluminium, then precision CNC machined to exacting tolerances, our pulley kits offer an exceptional bolt-on performance advantage without the need for supporting mods or tuning. In some vehicle applications additional performance benefits are available at high RPM by underdriving the accessories (slowing them down), which reduces the parasitic load on the engine. All underdriven kits are thoroughly tested to ensure that the benefit comes without compromising the accessory performance. It might be hard to imagine how reducing the mass of a pulley makes a car go faster, but accelerating a heavy factory pulley from say 3000-7000 RPM in a second or two saps a measurable amount of torque. 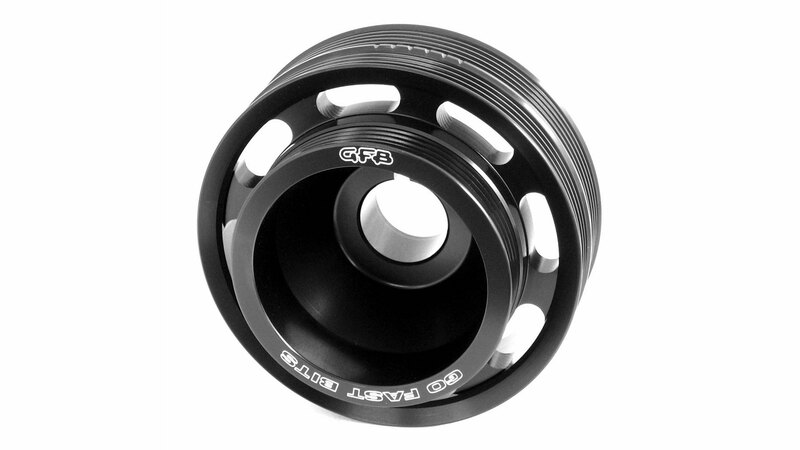 GFB Lightweight Pulleys reduce inertia by up to 85%, so most of the torque that used to accelerate the pulley can now be applied to the wheels. The improvement is shown in the acceleration graph above. 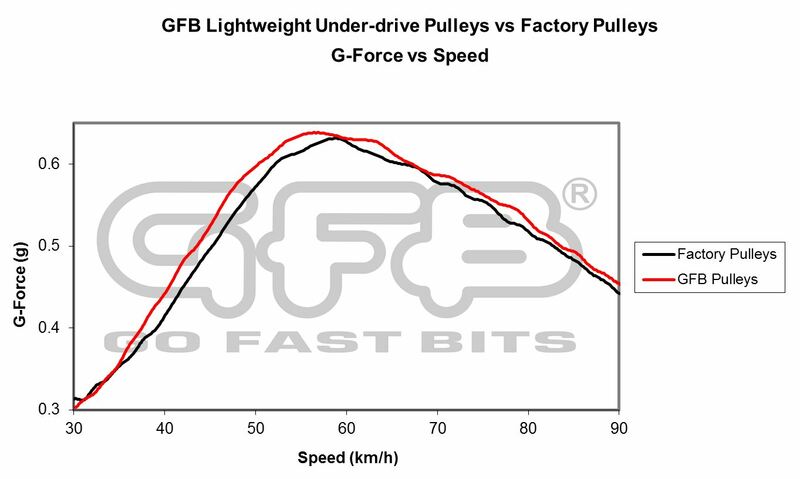 For a detailed analysis visit: gfb.com.au/tech/tech-articles/12-lightweight-under-drive-pulley-kit-performance-testing. 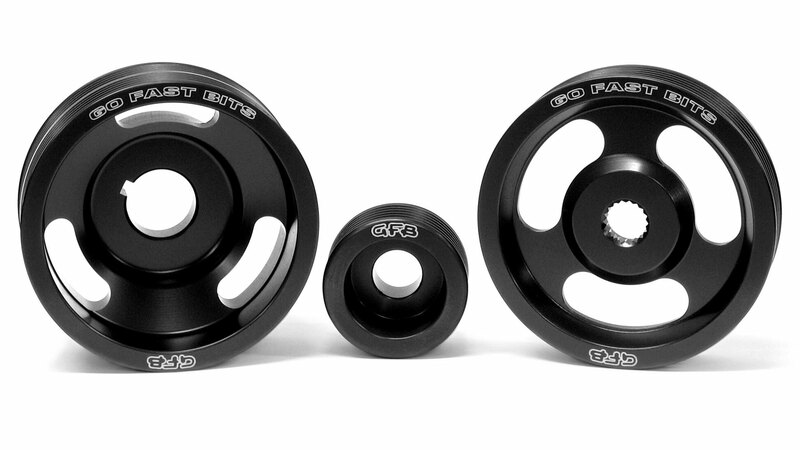 Is there a dyno graph of the Pulley Kit on the WRX? Yes, we tested an MY97 WRX on the dyno with and without the kit, and you can see that the chart shows significant gains at the bottom and the top of the rev range. The reduction in rotating inertia (we've removed about 2kg by using 6061 T6 aluminium billet) means that the engine can accelerate much quicker during the times it is making very little power before the turbo spools up. The result is better driveability off-boost and better acceleration, which is especially useful for those with large turbos that only make power in the upper rev range. The smaller size of the crank pulley under-drives the power robbing accessories so that the upper end of the rev range is less burdened, while still allowing them to operate properly. It is difficult to show the true benefit of the kit on the dyno, since the pulleys reduce INERTIA, which by definition is an object's resistance to acceleration. This means that the benefit only comes when the engine is accelerating, much like removing weight from your car. On a dyno the revs are brought up relatively slowly, and the difference is still noticeable. So on the road, a bigger gain is noticed when you accelerate quickly. Do I need different belts for the pulley kit? 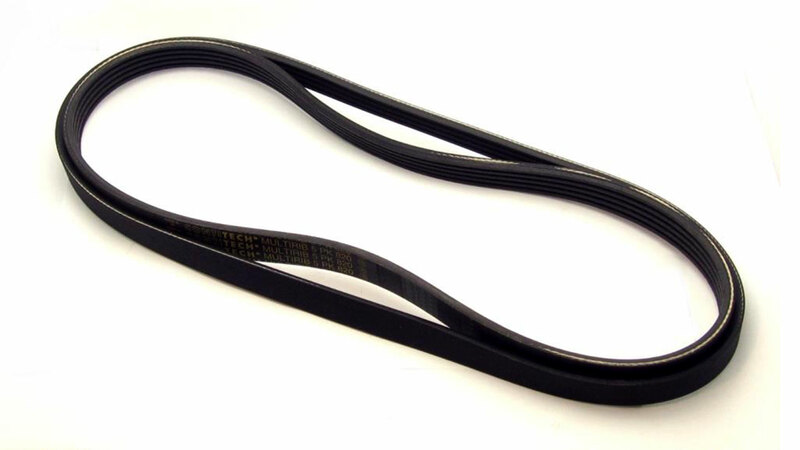 Yes, however the required belts for the WRX kits are included. All other kits list the correct sizes required. When using a GFB Power Up Pulley Kit, is there any problem with the removal of the harmonic balancer? Since the crank pulley in our Power-Up Pulley Kit replaces the factory harmonic balancer, people often express concern for the effect that this will have. It is important to understand the task of a harmonic balancer and why they are fitted to explain the effects of fitting a lightweight pulley. 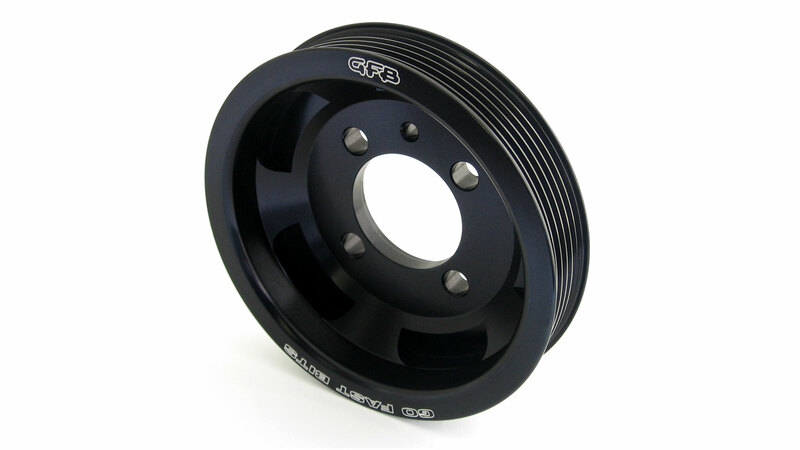 Isn't there a loss of torque associated with fitting lightweight pulleys, since the flywheel effect is lost? No. In early days it was common to fit large heavy flywheels to increase torque, which to a certain extent does work, but it is important to look at the context of the application. A heavy weight acting as a flywheel on the crankshaft has a greater resistance to a change in rotational velocity, which is termed inertia. The term "resistance to change in rotational velocity" applies to both acceleration and deceleration, so a heavy flywheel or pulley does oppose deceleration in situations such as towing caravans up a hill, but it will also oppose fast acceleration. It is easiest to think of inertia as an energy reservoir, and the laws of physics state that you can only get out the same amount of energy as you put in (actually in the real world it is often less due to irreversible losses). So an engine needs to put in a significant amount of energy to accelerate a heavy pulley before any useful torque can be extracted from it. Don't forget that when the engine is at low RPM before the turbo spools up, it is only making about 20% of its maximum power, and in this situation the amount of energy required to accelerate the pulley becomes a much larger percentage of the available power. If you were to measure an engine's torque whilst applying a load high enough to cause the revs to drop, then a heavy pulley will show a higher figure. But if you measure the torque whilst the revs are increasing, the lighter pulley will come out on top. If you can think of a case when your 200SX or WRX is at full throttle and the revs are DROPPING, then it means your engine is probably running on 1 cylinder. In a high performance engine the emphasis is on acceleration, not momentum. Are there any problems associated with under driving the alternator and power steering pump when using a Power-up Pulley Kit? No, the ratios are only reduced by about 15% on the alternator, and 20% on the others. This means that you get full charge at 1000 RPM instead of 850 RPM which will only cause problems if you plan to drive your car at idle for long periods of time with the fan, high beams, air conditioning, rear demister and stereo full blast. The reason for under-driving is that from the factory the accessories (alternator, A/C, power steering) are designed to run at almost 100% at or near idle, so at high RPM they are causing excessive and unnecessary drag. Reducing the drive ratio by 15% doesn't have a large impact at idle, but at say 6000 RPM, 15% becomes a much larger proportion and the reduction in drag is much more noticeable.